From the roof composite. Those pylons were on the very top. Still there I think. I posted this archive as a sort of anniversary. I wonâ€™t say how many years as itâ€™s embarrassing or difficult to acknowledge that much time going by. I think back to Sloane and the place itself sort of STOOD OUT OF TIME anyway. 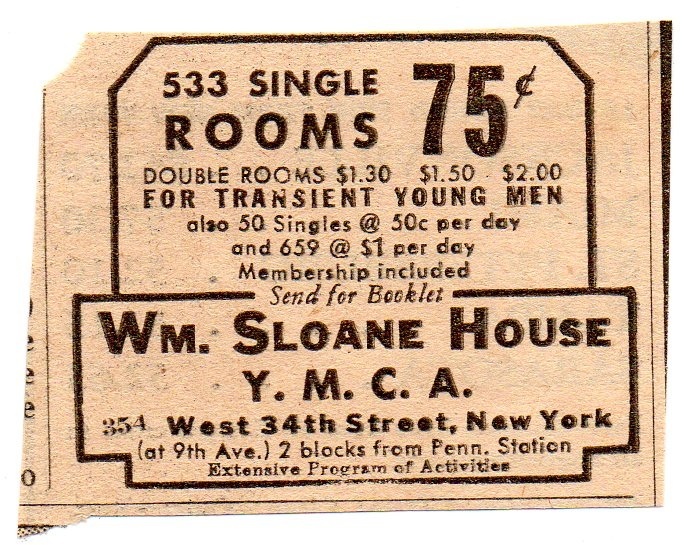 The 1600 rooms of the Sloane House YMCA were located at 356 West 34th street just below Hellâ€™s Kitchen near 9th ave in New York. It’s right above B&H Photo now. The School of Visual Arts dorms were there along with other schools like Parsons and NYU. The building also had floors that functioned as a hostel and a notorious 5th floor that was a long term S.R.O. (Single Room Occupancy). S.R.O.s donâ€™t really exist now in NYC the way they did then. 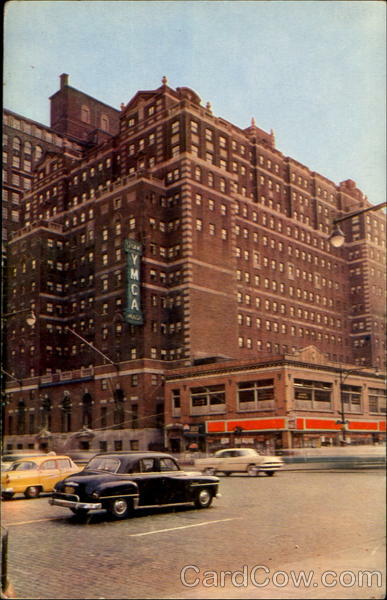 The history of the YMCA went back to the 30s where it was for ethical Young Christian men striking out in the big city. Soldiers stayed there extensively during the war. By the 70s it became a cruising backdrop for gay culture. It was sold in 1993 for 15 million dollars and now houses â€œluxuryâ€ rentals. This makes me laugh hysterically. I guarantee there are still certain restless vibes. If those people only knew what went on there. The building itself is structured around a figure 8 with these two very large pits that went down more than ten floors. Most of the rooms were about 7 x 11 with a window. The hallways were similar to train corridors in garish fluorescent light. Some more luxurious rooms in the corners actually had sinks. In my time there people used to throw everything imaginable out the windows into the pits, particularly at the end of the school year. If you were very unlucky and lived on the transient fourth floor for students and your room faced the pit, you were subject to rats, massive roaches and reputed dead bodies mixed in the trash. 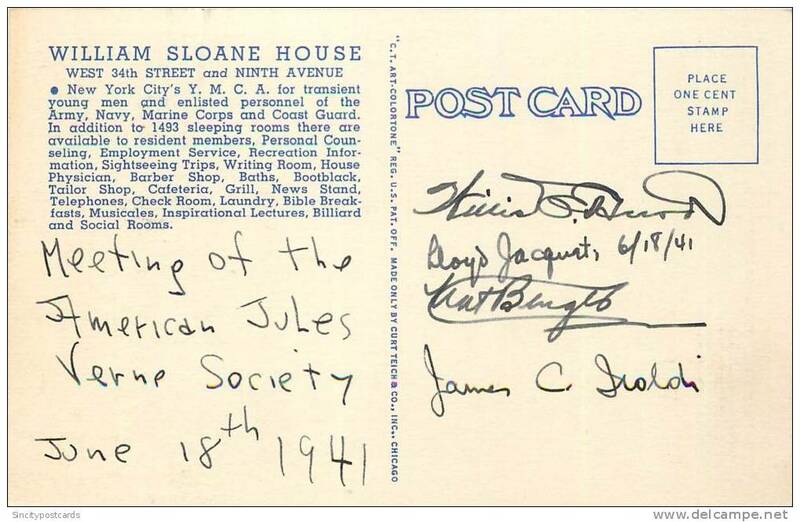 "Meeting of the American Jules Verne Society June 18th 1941"
As a Freshman direct from NJ, I showed up for the semester with a portfolio in late August and paid about $200 a month for the accommodations. The lease was hard to get out of and I canâ€™t remember if it was paid in advance. I do remember being stuck there for a second year because I couldnâ€™t break the lease. But I graduated up to a sink that year with more space. Ad found by Ephemeral New York from the 30s. 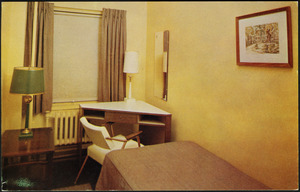 Vintage room from the 60s. As a resident that first end of summer night, it became wildly apparent that hundreds of young artists and creators were now suddenly your very close neighbors. It was excitement the boring hollow suburbs could never provide for me. This included people whose created sculpture, paintings, music, film, comics and writing. These passions crossed over and were a strong influence day to day. It was all doing and fearless nervous action. There was something profound at the possibilities of that community and being eighteen or nineteen. Also there was the pure energy of late 80s NYC shadowed with the epidemic of crack and the early days of AIDS. Being that, young people consistently got into trouble or explored areas they had no right being in. Because Sloane was a block and half away from Madison Square Garden, there was always an influx of style, drugs and attitude when something like the Grateful Dead would travel into town for a few days. It was almost what Iâ€™d imagine the center of an ever changing ancient Rome to be like. There were a series of jumpers from the higher floors who were always supposedly confused hostellers from foreign lands. On some occasions a body would hit a flagpole on the way down and bounce around. On other occasions I remember buses pulling up at the 34th street door and mental patients being off loaded to their new home. Somehow the concept of Sloane as a halfway house is perplexing as it wasnâ€™t located in any real reality. One of my favorite experiences was co-creating aÂ space called the Mood Room on the tenth floor in Jason C.â€™s studio. 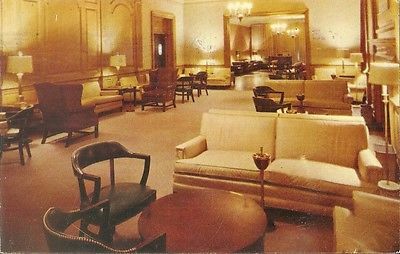 It was like a late late night lounge and we kept the key hidden above the door, so if you know where it was, you were in. Somehow a bunch of us managed to transport about eight old TVs, carrying them like a line of ants, from the Sloane trash back upstairs and created a wall of screens. The guards let us because we told them it was for an â€œart project â€œ as was everything. The stack of TVs didnâ€™t pick up any signals but some displayed a comforting static blue glow or just a dot. We also found some patriotic street chair on 23rd street that had E pluribus unum written all over it with eagles. We actually carried it back from 23rd street. Within the Mood Room we would leave this all night AM radio show on continually called Danny Styles. He played thousands of old eerie 78s which fit the middle of the night setting of Sloane remarkably well. Too well in fact. I remember noticing that the guard desk downstairs listened to the same station in the middle of the night. The ghosts apparently liked that music. There was also a large pear shaped guy named Elmo who used to waddle around all floor in circuits stepping over high students in the hallways to check the security keys in every corner every twelve hours. I wrote a song about him. We explored the structure of the place from top to bottom; from the roof to the sub-basement which was 4 spooky floors down. Our curiosity was infectious. 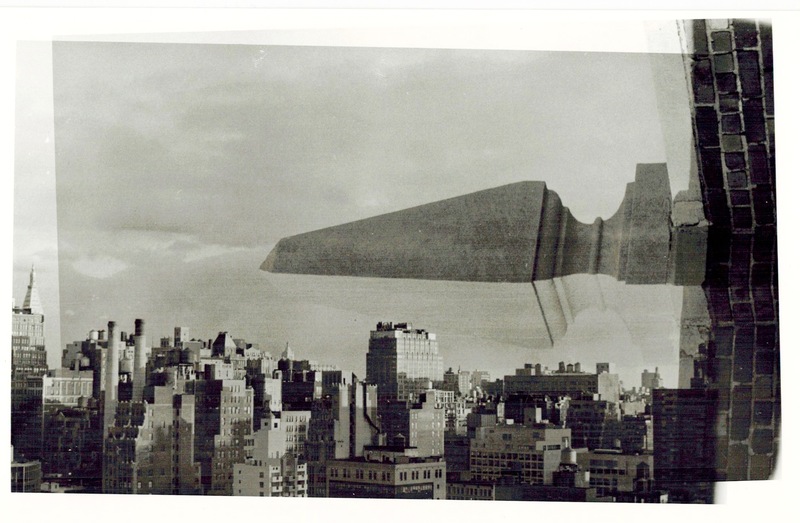 Hopefully some of these pictures and videos are evidence of that 30s industrial strangeness. Inexplicably broken and decaying sub machines and valves in the bowels serving some larger infernal machine. I remember one particular incident with Marc A. where we discovered aÂ room in back of the basement laundry that was unlocked. He strangely had a pith helmet on. This was where they kept all the lost luggage and mystery boxes from decades ago. We spied an entire defunct church organ, but before we could get near it a freaky man who was lying on a hospital bed!? sat up out of nowhere like a Frankenstein. We ran laughing frantically, slamming the gate behind us, our lives spared. Another intriguing character I never would have met otherwise was this crazy cat from Japan named Koji Kaia. We used to sit around and eat rice cakes with seaweed and drink Jack Daniels in his room. I remember him always THERE as he couldnâ€™t go all the way back to Japan for the holidays. He was also nocturnal and wold be up all night giggling as he drew on the blank message paper tacked to my door. The bi-product was a mini comic called â€œCows Have Their Own Facesâ€ published within Tuna Casserole that was an incredible anthology of SVA people produced at Sloane. There are far too many stories. I am just scratching the grimy funky surface. I still regret to this day not doing a formal documentary going from room to room, studio to studio interviewing everyone for 15 minutes. Iâ€™m also amazed at how there seems to be so little media about that place in time considering how many visual people there were. I guess it is all in an analog box somewhere. A Facebook groupÂ was set up a while back, and itâ€™s odd to see evidence of people who probably lived in my room years before me. But items on The Facebook donâ€™t really show in search engines and it could all go away tomorrow. Plus itâ€™s the CIA. Ah youth, itâ€™s torture to look back upon it knowing it is unrepeatable or you could never withstand and adapt to the madness with the same resiliency. Some of the photos are by Marc A. of Wowcool. Visit him! Ha. Thanks for the comment. I remember those firewalkers. I think they were all Moonies from the New Yorker. Yea they finally moved that diner. It was called the Cheyenne. Also the bar Twins is still there on 9th ave. Pretty much exactly the same. Wow. Nice read. I was an SVA/Sloane resident during the fall of ’89. Was recently researching Sloane House for a paper/presentation I am working on about memories. My personal experience with a jumper hitting the flagpole on the way down, landing three sidewalk squares in front of me, exploding from the waist down and then dying about a minute later while staring into my eyes from a foot away is etched in my brain for eternity. Don’t know if your time there was before or after mine, but can verify that happened at least once. So bizarre that you actually mentioned that; it wasn’t a search term I used to land on this page. That’s so intense! Sorry you had to see that in person. A difficult thing to forget. But these things make us stronger somehow. I remember jumpers happening every so often. I was there in ’87 or so but I remember someone talking about after I left too.